Jeremy Corbyn has dismissed the Queen's Speech as "threadbare", saying the government has "apparently run out of ideas altogether". The Labour leader highlighted manifesto measures not included, including grammar school expansion and cuts to pensioners' winter fuel payments. Boosted by his general election gains, Mr Corbyn said Labour was "a government in waiting". Theresa May congratulated Mr Corbyn on coming "a good second" to her. 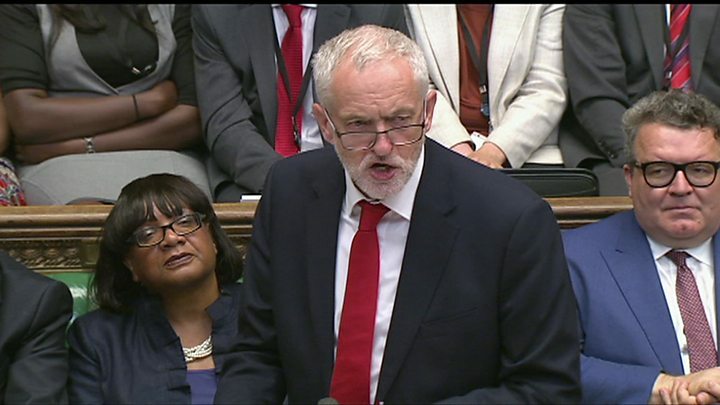 The Labour leader spoke as MPs began debating the Queen's Speech, which was dominated by legislation needed for the UK's departure from the EU. Several key manifesto pledges have been dropped, with the Tories left without a majority since the general election. The Labour leader was barracked by Conservative MPs angry at his refusal to let them ask questions during his speech. He highlighted some of his party's election gains, saying: "From Cardiff to Canterbury, from Stockton to Kensington, people chose hope over fear and they sent an unequivocal message that austerity must be brought to an end." Mr Corbyn singled out police cuts, saying in a dig at Mrs May: "I hope the current prime minister will correct the mistakes of the former home secretary." The Labour leader called for emergency funding to be made available for councils to check cladding and install sprinklers following the Grenfell Tower fire, which he described as a "tragedy and an outrage". "Something has gone horrifically wrong" he said, adding that the North Kensington community were "demanding answers and they are entitled to those answers". The prime minister apologised for the response to the fire, saying it had been a "failure of the state, local and national, to help people when they needed it most". Each family whose home was destroyed is receiving a payment to enable them to buy food, clothes and other essentials, she said. 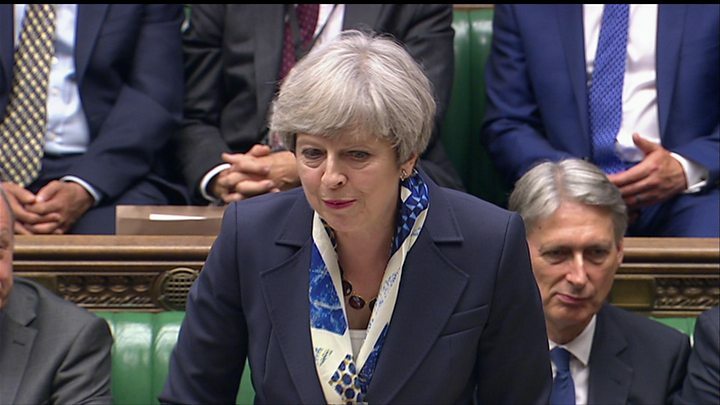 Mrs May also hit back at Labour MPs' criticism of her election performance - one, Kevin Brennan, described her as the "interim prime minister" - by pointing out the Conservatives had won the most votes and the most seats. Mr Corbyn, she said, had "fought a spirited campaign" and had managed to defy predictions to come "a good second".